DOWNTOWN BROOKLYN — Citi Bike riders have been left out in the cold. The bike share program has pulled a number of cycles off the street during the winter months to protect them from the record-setting snow and snow removal — leaving some popular docking stations across the city empty for hours at a time and in one case more than a day, according to officials and advocates. "We have pulled in a number of our bikes to aid in plowing efforts and to minimize the impacts of salt and winter road grit on the bikes," Citi Bike Director of Marketing and External Affairs Dani Simons said. "While certain stations may see reduced activity during these periods, this allows us to give them a more extensive servicing in advance of the spring riding season." Simons said more bikes would be back on the streets when the weather gets warmer. The city previously said Citi Bike service would continue as normal during the winter months, and added that the bike stations would be cleaned out soon after snowstorms. “NYCBS will relocate bikes from major streets to sidewalk and plaza stations and workers will shovel out stations promptly," Department of Transportation spokesman Seth Solomonow told DNAinfo in December. "If conditions make biking unsafe, the stations can be temporarily locked down, but service will be restored as quickly as possible once conditions permit." But some Citi Bike stations have stayed empty for dozens of hours at a time, including the worst offender: the docking station at Tillary and Clinton streets in downtown Brooklyn. That station saw its 31-bike corral registered as empty for 365 hours — the equivalent of more than 15 days — since Jan. 1, according to the blog bikeshareNYC, which logs data on Citi Bike stations. A 24-dock Fort Greene station — located at Fulton and Clermont streets — recently stayed empty for 28 hours straight, according to blog creator Ed Rademaekers — who uses data from an interactive map created by Oliver O’Brien, a researcher and software developer from University College London. A station at West 52nd Street and Ninth Avenue in Hell's Kitchen was empty for 282 hours over the last two months. And a station in downtown Brooklyn — at Cadman Plaza East and Tillary Street — was empty for 266 hours, the blog found. Yet, certain stations, such as the 109-dock station at Pershing Square and the 29-bike station at South Street and Gouverneur Lane are often full, according to O'Brien's interactive map. "I believe that the system has a decent chance to become as necessary a part of the public transit mix as a taxi or an A train," Rademaekers wrote. "That can only happen if bicycles are consistently available in all served neighborhoods. And all served neighborhoods must be served equally." Local Citi Bike-riders say they don't understand the continued shortage. "There are no Citi Bikes," said Fort Greene resident and lawyer Chesley Parker, 33, on a sunny March afternoon at a docking station near Fort Greene Park. "It’s 1 in the afternoon, the weather is great. I don’t see why there wouldn’t be at least one or two here." Simons said Citi Bike is addressing the issue noting, "We continue to work to refine and improve our rebalancing efforts across the system." 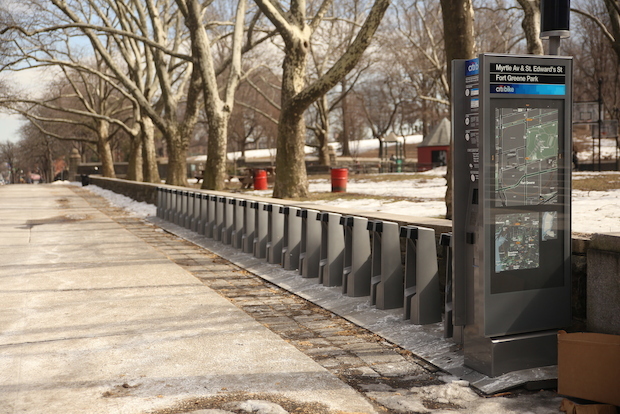 East Village Citi Bike stations — that DNAinfo New York reported were empty many days last summer — did not make Rademaekers's top 10 list of most-empty stations in 2014.